Neem Plus Pet Shampoo is a natural & safe way to clean your pet. Neem Plus Pet Shampoo is an all natural, mild & effective shampoo ideal for all pets & puppies, especially for those with sensitive skin. Aloevera : 0.50%w/v Shampoo base q.s. Neem Plus Pet Shampoo is a natural & safe way to clean your pet. Neem Plus Pet Shampoo is an all natural, mild & effective shampoo ideal for all pets & puppies, especially for those with sensitive skin. 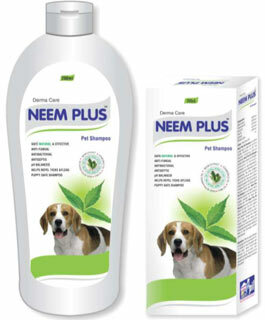 Neem Plus Pet Shampoo contains Neem extract (an antiseptic, antibacterial & antifungal) Chamomile oil (anti-inflammatory), Arnica oil (anti-inflammatory & an antibacterial), Pine oil (an analgesic which relieves the pain due to minor injuries on skin), Aloe vera (a natural moisturizing agent which nourishes& revitalizes dull dry hair follicles while ensuring a healthy skin). Neem Plus Shampoo is an organic formulation that is mild and safe for the pet’s skin and coat. It leaves behind natural residues of Neem on pet’s coat which discourage common pests from infesting the pet’s skin. Application: Wet hair, apply shampoo & massage into the coat, leave for 10-15 minutes & rinse thoroughly with clean water. Apply twice-a-week until symptoms subside followed by once-a-week. Frequency of use depends upon the disease & response to treatment. Indications : Neem Plus Pet Shampoo to be used for regular coat cleaning & conditioning, as a hair detangler, an important part of therapy for pets with allergy & routine skin conditions like dandruff, itch, bad odor, flea bites etc & helps heal minor scratches and abrasion naturally.